Though iBooks can handle content from many ePub sources such as Google and Project Gutenberg, you may prefer to explore the tools offered by other e-readers. Your iPad is capable of using other e-reader apps to display book content from other bookstores, so you can get books from sources other than iBooks Store. To do so, first download another e-reader application such as Kindle from Amazon or the Barnes & Noble Nook from the iPad App Store. You can also download a non-vendor-specific app such as Bluefire Reader, which handles ePub and PDF format, as well as the format that most public libraries use. Then use that application’s features to search for, purchase, and download content. Find your publication using the More list. The Kindle e-reader application is shown in the figure. After downloading the free app from the App Store, you just enter the e-mail address associated with your Amazon account and password. Any content you have already bought from Amazon for the Kindle is archived online and can be placed on your Kindle home page on your iPad for you to read anytime you like. Use features to enhance your reading experience such as changing the background to a sepia tone or changing font. Tap the Device tab to see titles stored on iPad. To delete a book from this e-reader, just press the title with your finger, and the Remove from Device button appears. Kindle was one of the first to offer a free e-reader for iPad. You can also get content from a variety of other sources: Project Gutenberg, Google, some publishers like Baen, and so on. Get the content using your computer if you want and then just add it to Books in iTunes and sync to your iPad. 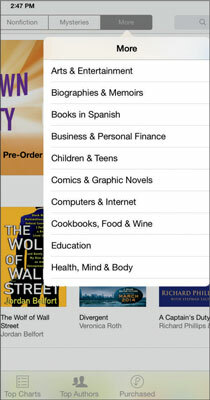 You can also sync books you’ve downloaded to your computer to your iPad by syncing to the computer and your iTunes account. Using this method, you can find lots of free books from various sources online, as long as they’re in the ePub or PDF format, and drag them into your iTunes Books Library; then simply sync them to your iPad. You can also download books from the web and use an online file-sharing site such as Dropbox to make them available to iBooks via an Internet connection. 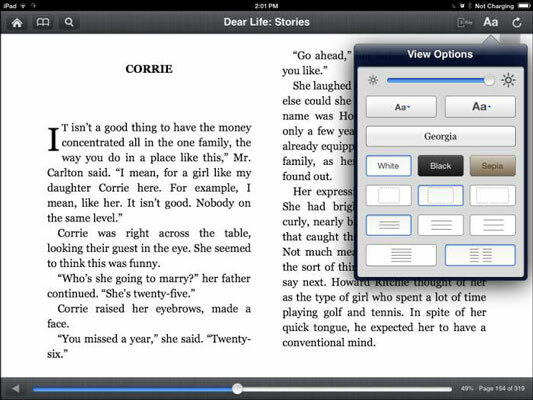 To convert e-books in other formats such as Mobi or RTF to ePub, use an application such as Calibre.